Every woman knows that when it comes to makeup, if you don&apos;t have the right brushes, you&apos;ll have a hard time making your face flawless. 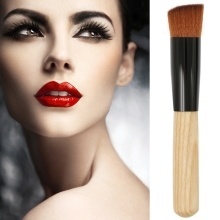 Brushes are essential tools for perfecting your beauty game, especially the foundation brush, for the foundation part somehow determines if your whole makeup is perfect or not, which is why we offer you this unique foundation brush. Ergonomic handle offers you easy grip and flexible control. Easy to use and clean, can be used for a long time.